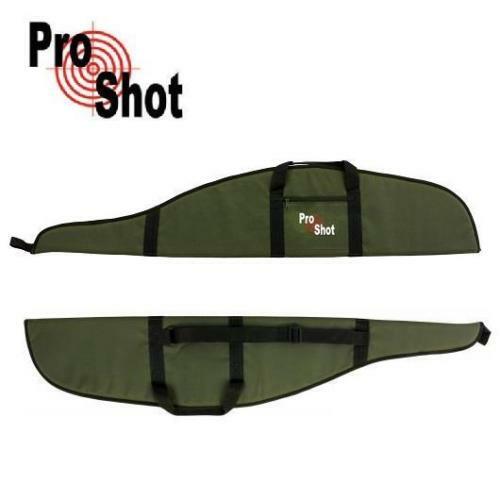 The padded rifle bag from ProShot fits most air rifles, either with or without a scope. Protecting your rifle and keeping it safe during transportation and storage. The bag is well padded from front to back for all round protection, and is sealed with a strong zip running along one side. A webbed handle is sewn around the whole bag for even weight distribution when carrying and long lasting strength. The rifle bag has a side pocket, with the ProShot logo embroidered into the front of it. This pocket is large enough to hold a tin of pellets and other small accessories with a strong zip to seal it once full.